Guaranteed Chemical-Free Bed Bug Treatment in Staten Island! BedBug Chasers Chemical Free Staten Island Bed Bug Treatment Guaranteed to KILL Bed Bugs Staten Island, just call us at 855-241-6435 for the Original “ONE & DONE” Bed Bug Treatment. No other bed bug treatment Staten Island is as Convenient as “ONE & DONE”, there is no better way to Kill Bed Bugs Staten Island than “ONE & DONE” and no other Staten Island Bed Bug Exterminator is as Discrete as BedBug Chasers of Staten Island! BedBug Chasers of Staten Island uses a family-friendly CHEMICAL FREE Staten Island Bed Bug Treatment to KILL bed bugs. Our process and equipment turns your infested home into a supercharged convection oven to Get Rid of Bed Bugs! This ground breaking, Non-Toxic, Chemical Free Staten Island Bed Bug Treatment is designed to kill and control bed bugs and bed bug eggs, but will not damage any of your furniture or contents and is completely safe for you and your family! Our bed bug heat treatment process is so safe to kill bed bugs and bed bug eggs that it is used on airplanes and marine vessels! Our Chemical Free Staten Island Bed Bug Treatment is so effective and SAFE it has been used in NYC Cancer Hospitals to KILL Bed Bugs. The BedBug Chasers of Staten Island Chemical Free Bed Bug Treatment Staten Island to Kill bed bugs is so Eco-friendly you can re-enter your home immediately after the treatment with no fear of toxic fumes or residues! While it is safe for your family, the clean, dry, odor free, Green electric heat produced by our BedBug Chaser heaters is instantly lethal to every bed bug, nymph and egg as well as many other insects lurking in your home. So when you and your family return from work and school, you can have the peace of mind that your home is totally bed bug free. If you’re one of the many suffering from bed bug bites, then it’s time to take action you need a Chemical Free Staten Island Bed Bug Treatment! Don’t call a regular Pest Control Company; instead, call the Bed Bug experts – BedBug Chasers of Staten Island your “ONE & DONE” Bed Bug Heat Treatment. 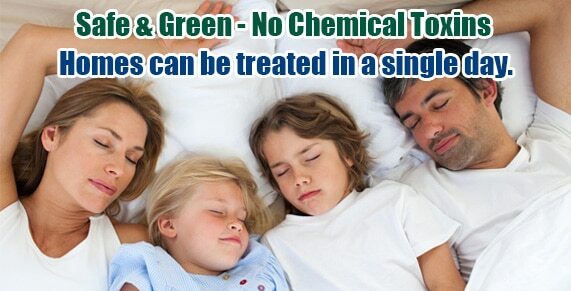 It only takes ONE simple Non-Toxic, Chemical Free heat TREATMENT completed in ONE DAY. Don’t rely on regular pest control services using ineffective chemicals when you can have BedBug Chasers of Staten Island. Our Chemical Free Staten Island Bed Bug Treatment method is 100% effective in killing Bed Bugs unlike other Chemical Free Staten Island Bed Bug Treatment methods, we kill all stages of bed bugs. Trust us when we say you’re not alone, there have been many Staten Island bed bug bites. The main problem with Staten Island bed bugs is that they reproduce rapidly. Once you realize that you have an infestation, there is no time to waste! Contact our BedBug Chasers of Staten Island office that Guarantees to KILL Bed Bugs Staten Island. If your home or business suffers from bed bugs then you need the Best Bed Bug Treatment – BedBug Chasers of Staten Island to be there and solve your bed bug bites Staten Island. It truly only takes ONE TREATMENT and only ONE DAY to kill each and every bed bug, nymphs and eggs included with NO CHEMICALS what so ever when you choose BedBug Chasers’ Chemical Free Staten Island Bed Bug treatment method. BedBug Chasers of Staten Island’s electric heaters are digitally-controlled and fire-safe. They are completely fume and toxic chemical free, making them perfectly safe for humans and pets, while being totally lethal to bed bugs! If everyone who needed to get Rid of Bed Bugs Staten Island contacted BedBug Chasers of Staten Island, life would be much easier. They’re here to solve your bed bug problems, once and for all. Another great thing about BedBug Chasers of Manhattan that makes them the best choice to remove bed bugs is that at the end of the treatment, they’ll provide you with a report that shows what was encountered, the measures taken to defeat what was encountered, and also the temperatures that were reached. Don’t look for just any Bed Bug Exterminator in Staten Island! Contact BedBug Chasers of Staten Island: the Original Staten Island Chemical Free Bed Bug Treatment company today! BedBug Chasers of Staten Island uses superior engineering and technology to allow rooms to heat or “bake” much like that of a convection oven, which heat much more quickly and evenly than old-fashioned ovens, Killing Staten Island Bed Bugs faster and 100% Chemical-Free! Convection is a combination of diffusion and the bulk motion of molecules. Near the surface of the object being heated (a sofa, mattress, clothes in a closet) the air velocity is low, and diffusion is how most heat is transferred, but deep inside that same object, the bulk motion is increasing. When heating an object, the density change in the outer most surface will cause the air to rise and be replaced by cooler air that again will heat and rise. Since the BedBug Chaser heater accelerates airflow on two axes simultaneously, it allows diffusion to occur at a much faster rate and creates a quicker density change on the surface of an object. More simply, the new design accelerates the convection process producing supercharged heating for the best Staten Island Chemical Free Bed Bug Treatment.